ALMADA, Portugal (Reuters) - In the Portuguese town of Almada, Communist activists are handing out leaflets that bear the hammer-and-sickle logo and triumphantly proclaim: "Government destroyed, victory for the workers' struggle". It seems like a throwback to a bygone era. But a leftist alliance could soon be in charge of Western Europe's poorest country - a prospect that alarms the business and conservative political elite just as it seemed Portugal had weathered economic crisis. The different sides are staking out hard positions and many are calling this Portugal's most critical political moment since the Carnation Revolution of 1974, when a dictatorship was overthrown by young army officers and democracy brought in. After an inconclusive election led to the ousting of the center-right government, President Anibal Cavaco Silva is weighing up his choices and it is not yet certain that a leftist alliance led by the Socialist Party (PS) will take power. But Portugal is undoubtedly in for a period of political instability and polarization that could undermine investment and hence the country's fragile economic recovery. The rise of the left is also a push back against austerity imposed by Berlin and Brussels and threatens to undermine the European drive for sounder public finances and more competitive economies. And it may foreshadow events elsewhere in Europe. 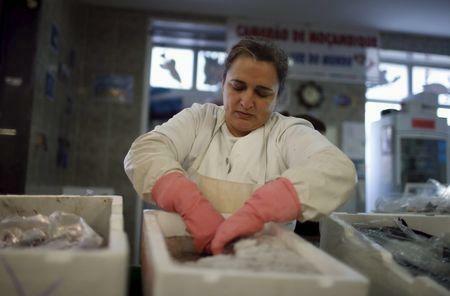 In Almada, across the River Tagus from the capital Lisbon, 41-year-old Sonia Silva, who runs a fish stall in the market, said the country's problems were about the poor being squeezed while the rich cruise along as usual. She complained about high taxes and worsening schools and hospitals. "The situation is extremely difficult. We pay and pay and get nothing back," she said. "I have no way of escaping from tax, everything we earn we have to declare. The big firms have people thinking 24 hours a day about how they can avoid tax." 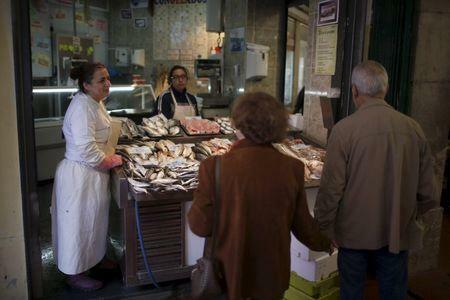 Fewer people were shopping at her stall, she said, because they went to the cheaper supermarkets where they could rack up credit on cards, even though the fish was not so fresh. The best prospect for her children would be to emigrate, she said. The political crisis arose after Prime Minister Pedro Passos Coelho's center-right coalition won most votes in an election on Oct. 4 but failed to win a parliamentary majority in a backlash against austerity. The Socialists led by Antonio Costa then formed an alliance with the hardline Communist Party (PCP) and the Left Bloc to oust Coelho. President Cavaco Silva must now decide whether to allow them to form a government. The decision could take weeks. For Antonio Saraiva, president of the Portuguese Business Confederation, instability would be economically disastrous. "Portugal needs to attract investment, foreign and domestic, and therefore needs stability. National tranquillity right now does not exist," the dapper Saraiva, known here as the Boss of the Bosses, said in his office overlooking the Belem waterfront. "What we fear the most is that the reforms initiated under the previous government may be interrupted if a government majority based on the current parliament majority of PS, PCP and Bloco is formed." When the euro crisis first broke out in 2010, Portugal was seen as a domino that might knock down bigger countries such as Spain and Italy. 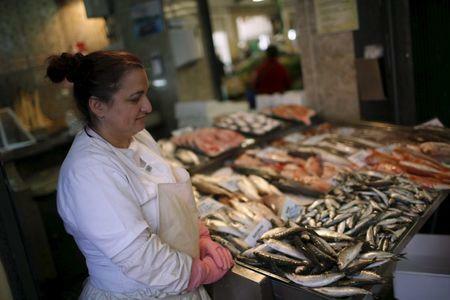 But it has been lauded by euro zone leaders for sticking to an austerity strategy laid out after it received 78 billion euros ($83 billion) in the bailout in 2011. The Socialists main economic architect, Harvard-trained Mario Centeno, has said a Socialist-led government would abide by austerity plans in general. But some measures could be reversed, including tax increases, and cuts to pay and pensions. The Communist Party posters plastered on walls in Lisbon read "Defend April" - a reference to the 1974 revolution. Armenio Carlos, head of the Communist-linked CGTP labor union, has the air of a man who is relishing the fight. "The Portuguese people's stance at the election was one of rejection of the policies of the center-right," he told Reuters. "The Portuguese have already been punished. This idea of an alternative is creating hope." Carlos said Cavaco Silva might try to prevent the Socialists forming the next government. "If he did so it would create a serious institutional conflict that could lead to a dangerous radicalization of society." Cavaco Silva must respect the constitution, Carlos warned. Critics of the left have focused on the fact that the Socialists have signed separate agreements with the Communists and Left Bloc to guarantee majority support in parliament. A Socialist-led government would have to negotiate each budget, and other measures, with its partners. If there was a clash with Brussels, the Socialists would have to go back to both parties for approval. Joao Galamba, 39, a Socialist member of parliament, sought to allay fears of a rupture with the euro zone generals. "We have approved a moderate program with the full participation of Europe. All negotiations have to be made within financial restraint. It was accepted by the parties of the left," he told Reuters. "We are a center-left party and we are in full cooperation with our European partners. We are not against them." If Cavaco Silva chose the option of appointing a caretaker government pending a new election next year, it would only lead to more uncertainty, he said. "The left is selling paradise. These promises of paradise are empty," said Carlos Carreiras, mayor of the well-heeled seaside town of Cascais and a vice-president of Passos Coelho's Social Democratic Party. The left was mounting a coup, he said. "During 41 years of democracy the ones that won the elections were the ones that governed, even without a majority," he told Reuters in the 18th Century mansion that is now Cascais town hall. After this year's elections in Greece swept the hard-left Syriza party to power, vowing to reverse austerity measures imposed by international creditors in exchange for bailouts, EU and German officials and investors had hoped mainstream parties would retain power in Portugal and Spain. But some commentators have suggested that Portugal could go the way of Greece in confronting Brussels. While the Socialists have always been a moderate party, the fear is that the Communists and Left Bloc will push them to the left. As before, Portugal could be a harbinger for what might happen in neighboring Spain. It holds a national election next month with the ruling People's Party (PP) hoping it will get the credit for an economic rebound, despite austerity measures. Analysts fear Spain too faces a period of weak, unstable government; polls show the PP might fall short of a majority, meaning it and its main rival, the Spanish Socialist Party, could seek to forge alliances with new, smaller parties. Spanish Prime Minister Mariano Rajoy has already expressed unease at developments in Portugal. Whoever takes power in Portugal faces a mountain of problems. Unemployment is about 12 percent, mostly young people. Indicative of the dearth of opportunity, a total of 485,000 people left Portugal between 2011 and 2014 to try their luck elsewhere in Europe, Brazil, Angola or other parts - a staggering figure for a country with a population of 10 million. The Bank of Portugal expects growth of 1.6 to 1.7 percent in 2016 but, said Saraiva, the country needed growth of 2.5 percent to 3 percent to keep the recovery on track. One entrepreneur who spoke to Reuters remained optimistic about the investment climate. Miguel Fonseca, CEO of tech company EDIGMA, is putting 2 million euros into building a factory in Braga to make touchscreens - the kind of project Portugal needs if it is to diversify its manufacturing sector away from the traditional shoes, corks and textiles. His firm's fortunes were more dependent on the global economy, he said. "We will keep doing what we have done," Fonseca said. "If the country takes a few steps to the left, well OK. I’ve talked to bankers and they feel the same."